A special exhibition of works by American illustrator Paul Desmond Brown (1893 - 1958) from the NSLM permanent collection will be on view August 29, 2015 to January 17, 2016. Approximately 25 works, including original pencil and ink drawings, sketches, and watercolor, will be on display. Original pencil drawings from some of Brown’s most popular books Spills and Thrills (1933), Ups and Downs (1936), and Good Luck and Bad (1940) will be on view for the first time. The exhibition highlights Brown’s steeplechase images from the 1930s. In conjunction with this exhibition, NSLM will be publishing the Inaugural Llangollen Race Meeting Sketchbook. 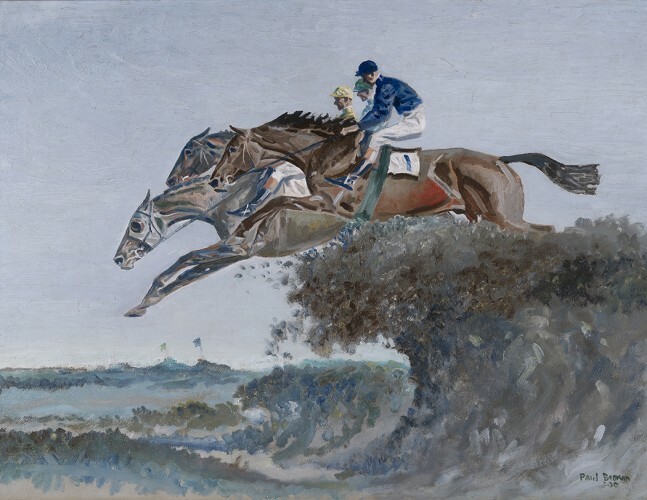 This collection of previously unpublished sketches by Paul Brown documents the glamorous steeplechase held at Llangollen Farm, in Upperville, Virginia, in 1931. The book features an essay by racing historian Dorothy Ours. The book will now available for purchase. Click here to learn more or order your copy.